Beck Keverich has no choice. He must play the piano for hours a day, to attempt to please his abusive mother. Beck has dreams-dreams of leaving, of composing his own music. But, that is not an option. That is, until he is forced to partner with August Frey for a school project. Suddenly, his whole world is changing. As he struggles to understand his feelings for her, he must make choices that will change his life forever. 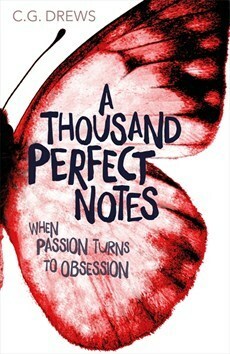 A Thousand Perfect Notes is a YA Contemporary/Romance. I’ve wanted to read ATPN (A Thousand Perfect Notes) since Cait (C.G. Drews) from Paper Fury announced its publication on her blog. When I saw it only cost $4 on Kindle, that sealed my decision. When I finally began to read it, I couldn’t stop. Right off the bat, I noticed that Cait has a unique narration style, which I personally enjoyed. She has a way with words that make you really feel for the characters. I felt every emotion while reading this book. Each character was well written. Beck’s little sister Joey was hilarious and so cute. I really liked August. Some people thought she was stereotypical, but I thought she was just what Beck needed. Think hippie Luna Lovegood. The Maestro (Beck’s mom) had an interesting backstory. Though she was the villain in the story, Cait did a great job of explaining why she did what she did. As for Beck, It was nice to see him change as the story went He’s really sweet and I hated to see him treated the way he was. The story itself was really heartwarming. There were a lot of twists and turns. Some, I saw coming. Some, I didn’t. Emotionally, I loved the end, but I wanted the book to keep going. I will definitely be rereading ATPN soon. There wasn’t much I disliked about it. I do wish there was a guide to the German because sometimes it was hard to understand what the characters were saying. Also, as pretty as the cover is, I’m not really sure how it fits into the story. Just a note, the book has some Australian terms, that readers may not immediately understand. However, much of them are self explanatory. I recommend this book for ages 13+. There is a lot about physical and verbal abuse and there is some cursing (In both German and English), but not on every page. Have you read ATPN? What are you currently reading? Great post, Rose! I’ve been wanting to read ATPN after the numerous positive reviews from other bloggers. I have a kindle, maybe I should start reading it on there once I’m done reading my current book. Whew, it feels so good to be back in the blogospere ​and see lovely posts like this! Yes, you should definitely read it. Aww, thank you so much, Katie! No problem, Mya! I’m glad that you like it. Lovely review! Oh, I really loved ATPN too. I agree, Joey was hilarious and such an adorable character! And August as “hippie Luna Lovegood,” oh my gosh, so true, and I love that so much, haha. I totally agree about the German! In some languages, terms are probably what they sound like, but that wasn’t the case here. But I loved this one so much as well! The emotions were just real and they kept coming. 😉 Lovely review! Thank you, Aimee! I agree, the book was an emotional roller coaster.